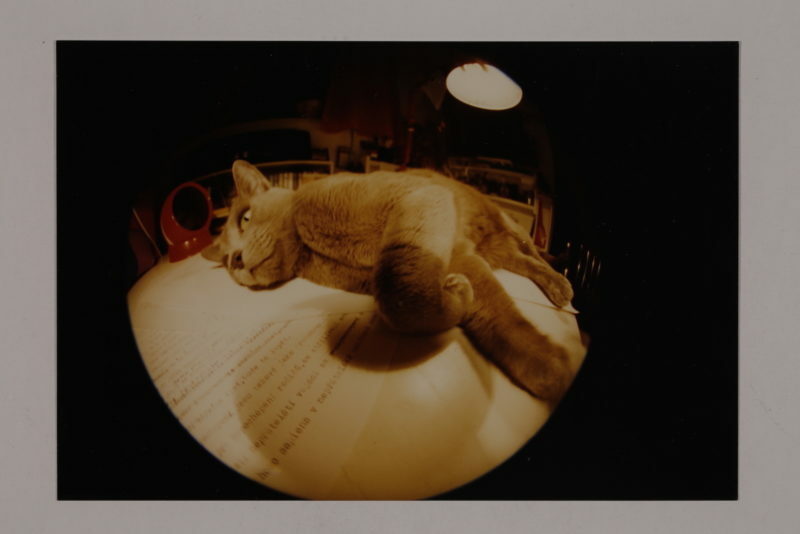 Photograph of cat by Ester Krumbachová. In continuous rescue and renewal throughout her life, these loved ones were her constant writing companions at home in Prague. The letter to her cats is the third in this series. There are good times and bad times that touch people with an intimate antenna without changing anything about the overall situation. These letters are written in quite bad times, but I think that in them there is a lot of desire to talk to someone. Sometimes telephone conversations aren’t the worst, but written words and monologue, in dialogue together, sometimes give you the chance to talk yourself out of a situation, collapse into bed, and fall asleep. Sometimes before sleeping you can still laugh over something you think you remember in a letter, but that wasn’t in it. It wasn’t even written down, not even shared, but somewhere between the lines, green groves lie verdant—and if not groves, then at least little leaves—because communication is in and of itself a step towards the concept that tomorrow will be better. Tomorrow is thus one of the most dangerous words, if it is about creditor and debtor, but is otherwise great support for those who put credit in life. Nothing can be survived without humour and jokes, let alone life itself. A letter that hides something from its witness, absent at that moment but existing, is a great comfort. Such long letters are written mainly when out of your own skin, trying to get back into that skin, in order to claim it. This isn’t a joke—you write and write and write, even though you would really like to scream and explain to the other person why you are screaming. Making light of something is a wonderful thing—staring at her letter she might just want to start sobbing, but the power of her ego rescues her and she quickly understands there’s no sense in draining herself to the ruddy depths of exhaustion worn underneath the heat of her skin and close to her kidneys. That she has to learn to circle things with a finger so they don’t shoot up to the heavens like the naked butts of problems, that she has at least to paint them, tattoo them, change their clothing, so that they can be laughed at, at least a little bit. She will give information about herself and her desire to write to you, to speak to you. She doesn’t want or intend to annoy someone she likes. And then she ends up in these terrible stages of life, rather than sleeping healthily, talking to someone. Disjointedly, she jumps from one topic to the next, fantastic with the word TOMORROW!!!TOMORROW!! I’ll be better soon, she says to herself while writing. Soon I won’t have to bother people. But sometimes that won’t even happen TOMORROW. She gets up, reads her all-night letter, and grabs her head at who the hell could even stand to read such anxious chatter all the way through. The humour has disappeared behind the stove, the inspiration of sharing and intimate laughter is gone, it’s just morning. And another day ahead of you, my friend. One way or the other—some letters you immediately rip up into small pieces and toss, while others, which you’re still thinking could be sent in a week or so once they mature, stay sitting in the drawer and you throw socks and pour out your ashtray over them—but somehow you don’t have the strength to destroy them, you only want to not see them. And then—at a certain, different time—you find them by chance when you’re looking for socks and say to yourself: this is really quite a funny letter, why didn’t you send it? It’s too late now, sending a letter several years old to an addressee who has died in the meantime. Or to one who—all flushed and alive—would wonder why you’re sending a letter with such a delay, because in that case another letter would have to be written explaining why THAT letter wasn’t sent. Rather, writing letters is a comfort for personal hopelessness and a desire to be with someone at night—at least, these letters are of that type. I don’t know what follows from that. In all probability nothing. But it doesn’t matter. Something doesn’t always have to follow from something. Letters don’t exist without hope in communication—but that communication is sometimes so strangely fitted in the pipes and tubes and ducts, no? Who knows what it says about the underground movement of the soul—communication can be one-sided. The only one who communicates with the illusion of her own loves and sympathies is the one who wrote it.